What Does The Colour Of Your Front Door Say About You? world to ‘look at you’ and is for those that are not afraid of standing out from the crowd, or the local neighbourhood. An Orange Front Door: If you have an e23 jacko lantern or an u8 midnight sun orange painted front door you’re saying that you are a fun and friendly person and you enjoy getting together with other people. This is great if you want to get to know your neighbours, but not if you are a more reserved person. A White Front Door: A crisp white door in a5 bone, a10 old white or a26 shadow white shows the home of an organised, neat, tidy and clean person or family. The crisper the white of the painted door, the cleaner the family. 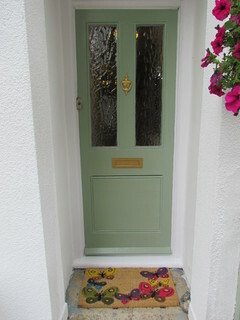 A Green White Door: A green painted door in d2 apple, d3 wedgewood green, d7 folly or k25 wood stock shows that the people living in the home care about each other, the neighbourhood, their community and you have more traditional views. A Black Front Door: An o14 anthracite or o19 malt painted front door offers a timeless look saying that you and your family are consistent, conservative, reserved and don’t waiver for the latest fashions and trends. A Blue Front Door: Painting your front door with c19 blue yonder, c4 air force, h27 haapsula, c11 fleet or c17 baltic sea it says that you have an easy go‐with‐the‐flow personality and people will easily to flock to you, especially your neighbours. A Yellow Front Door: If you opt for a e23 vanilla, e8 sunset, e18 lemon, g19 chawka gul or g20 miro yellow front door it offers a sunny and brightness to your home. 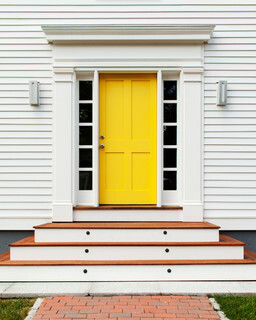 It is likely you are the leader of the neighbourhood if you opt to paint your front door in a shade of yellow. A Purple Front Door: Choosing shades like b6 blossom, b7 lilac or g23 mosaic to paint your front door purple you are telling your neighbours that you are comfortable taking risks, you’re a big dreamer and maybe even a free spirit. 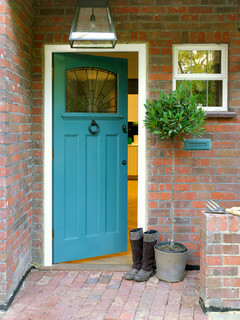 What colour would you paint your front door to best suit your personality? We have over 10000 of our own eicó colours, which can be applied to every wall and floor finish. If however you cannot find the exact colour, we can work with you to create or copy any colour of your choice. We can also help you build your own unique colour range. Can I cancel my order or return my unwanted paint? What are VOCs and why are they harmful? If you have a long thin room, and you would like it to feel more square, then try painting the 2 short walls in a darker tone (say 50% darker) than the 2 long walls. The result will be that the 2 darker walls will have a greater impact on the room and have the effect of bringing them closer together – thus making the room feel more square.